Dr. Pierre Larose has acquired more than twenty years of surgical experience. He earned his medical degree from Université de Montréal in 1988, with a first specialization in general surgery and a second in vascular surgery. In 1995, he joined the surgical team at Cité de la Santé de Laval, where he practiced for five years and contributed to the development of vascular surgery. Dr. Larose then settled down at Centre Hospitalier Charles-Le Moyne in Greenfield Park, focusing exclusively on vascular surgery and setting up a vascular physiology laboratory, which he managed until 2013. 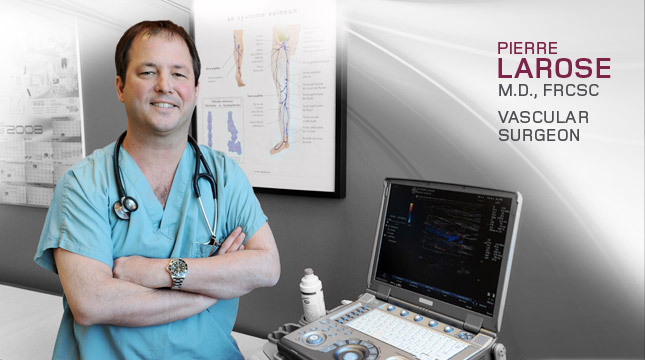 In 2010, he founded the Pierre Larose Clinic in Brossard on Montréal’s South Shore, in order to offer the proper treatments for the various types of varicose veins. Located at the heart of Quartier DIX30, his clinic is a leader in the field of varicose vein treatment and vascular surgery. His team of specialists and the experience that he has acquired allow him to provide patients with advice and guidance through every step of the process.